12 April 2017: When ASHC delivers training in media production we stress – do not commission anything until you have your distribution process worked out! In Northern Ghana we have taken this very much to heart. We have partnered with Countrywise Ghana to produce and distribute a film on soybean farming. Countrywise is our partner because they too are passionate about film distribution. We are producing a film that explains all of the steps in soybean farming from land preparation to post-harvest. In particular, we are promoting the use of improved seed varieties, inoculant and P fertilizer. The film will be finished in the next couple of weeks. Countrywise will then load it on to motor tricycles complete with generators and film projection equipment. In total they plan to tour to 102 farming village communities that speak either Dagbani and Gonja. We anticipate reaching audiences of around 10,000. Ahead of time Countrywise meets with the traditional authorities and the extension services to make sure that they are expected, and that an audience will turn out to see the film. They also have to sort out the local customs to get the timing right. There is a big variation in when communities choose that have an evening meal – and this dictates the start time for the screening. The evening will start with a short music film which has broad family appeal. This is followed by the main feature our film on growing soybean. The screenings are open-air and so can be at the mercy of the weather – just occasionally they are rained off. They can also be overtaken by event such as funeral in the community which makes the screening inappropriate. These are the exceptions. Most evenings the screening will be watched by clusters of family groups sitting together, learning about the technology. Hosting the screenings in the villages mean we also have the opportunity to collect telephone contact details and link farmers to agro-dealers to access the soybean inputs. We can also experiment with printed material that reinforces the messages in the film. In Ghana we are also exploring sharing films on mobile phones either as downloads or shared using the Bluetooth facility. At each point when Countrywise engages with communities, from the planning to the delivery of the film, they will look for opportunities to share the film with mobile phone owners. We are planning to share the films through the agro-dealer and extension networks. Our friends at Access Agriculture know about sharing films. They run what is described by one of their users as ‘the best and largest and online agriculture training video library’. With films shared by organizations around the world, they now have materials in 75 languages. Ronald Kondwani Udedi has shared a great story with Access Agriculture that shows how important distribution strategies are. He worked for a film production unit in Malawi which was disbanded – as organizations increasingly used radio because they could reach an audience. Many farmers say that seeing is believing and Ronald was convinced that film had a useful role to play to in disseminating agricultural information. In around 2011 computers became cheaper in Malawi. Around the same time there was an influx of cheap GSM phones from China. These have basic internet access and a memory card slot, so they can play back audio and 3gp videos offline. This is good enough for the latest films, music and any video. Young Malawians started to set up “burning centres” which were often nothing more than a PC on a table in a small room. The young men proudly called themselves “DJs”. They attracted new customers, villagers who were eager to get Malawian music videos, and movies from Hollywood, Bollywood and even Nollywood. They uploaded the films on to their phones and charged just a few cents. Ronald and his colleagues approached some DJs and asked them to consider offering agricultural titles at that time the Access Agriculture had 37 films in Chichewa which they shared with DJs. Initially the young men were sceptical about whether there was a market for training films rather than entertainment. By 2015 there were 96 DJs in Malawi distributing videos on rice, chilli and how to fight Striga. What this means is that rural farmers can now can sit around as a family and watch these films. This has also allowed farmers to re-watch the films at the proper season of the agricultural calendar. All this for an investment by the farmers of as little as 5 cents. This has become an important business strand for the DJs who continually checking to see if there are any new titles for them to share with farmers. There is a lovely blog on Agro Insight’s website which shows how this film distribution led Lester Mpinda to be a profitable chilli farmer and rice innovator. This all makes film a very attractive media for a gendered project. The unit of production in Africa is the farming household and to be able to have a media that can reach the whole family together, and give them all first-hand experience of the message, is likely to result in better uptake. In many cases where new technologies are shared the families are reliant on one family member who received the training. Typically this has been characterised by men attending extension meetings. This means that in many cases families think they have adopted a technology but they have got key elements wrong. Family attendance at the screenings mean that they share the job of remembering the finer details. 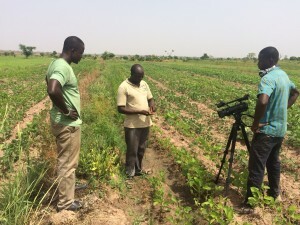 We believe that with the right distribution strategies film has tremendous potential to support farmers to adapt new agricultural techniques and technologies. That the distribution opportunities makes this a farmer-friendly and family-friendly way to share information. The screenings in Ghana start in mid-April ahead of the soybean planting season – the subsequent research will help show if we were right.